Thanks to everyone who came along to my shows in April, lovely to see so many new faces. I have a Singing Performance Workshop on 29th April, only 1 space left. 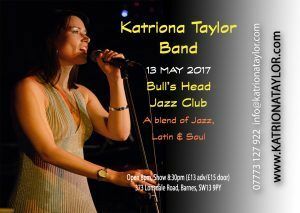 Also the next gig is on Saturday 13th May 2017 at The Bull’s Head, Barnes, I’ll have my fabulous band Vasilis Xenopoulis- Sax, Simon Pearson – Drums, Dave Jones – Bass, John Crawford – Piano performing that night.